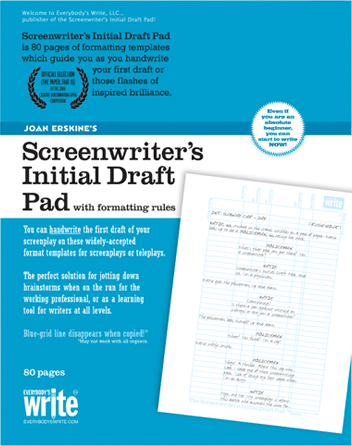 The Screenwriter’s Initial Draft Pad is a tool for seasoned screenwriters as well as anyone who dreams of writing a screenplay. 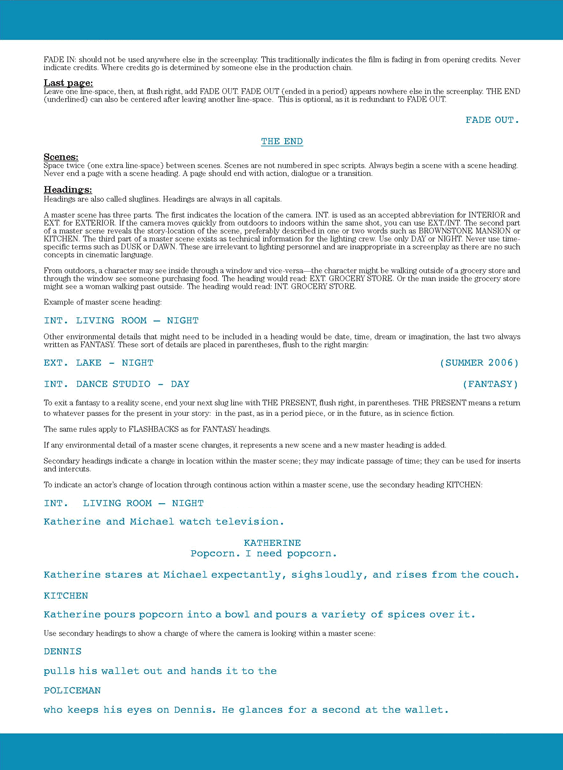 Eighty pages of graphed templates guide you to handwrite your story in the industry approved format that turns the process of describing who, where, when and what is happening into an easy-to-read, standard system that producers, directors, and actors can easily recognize. 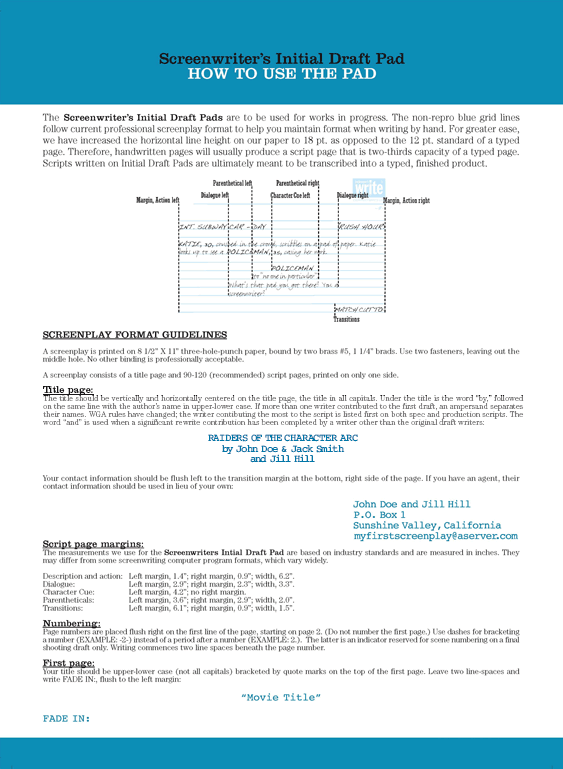 Final drafts must be typed, and computer programs simplify formatting as you work, so why handwrite a first draft? People handwrite screenplays when they: want the freedom to write anywhere, anytime; prefer handwriting; aren't ready to invest in a computer program; and when they are directors and writers editing during production. 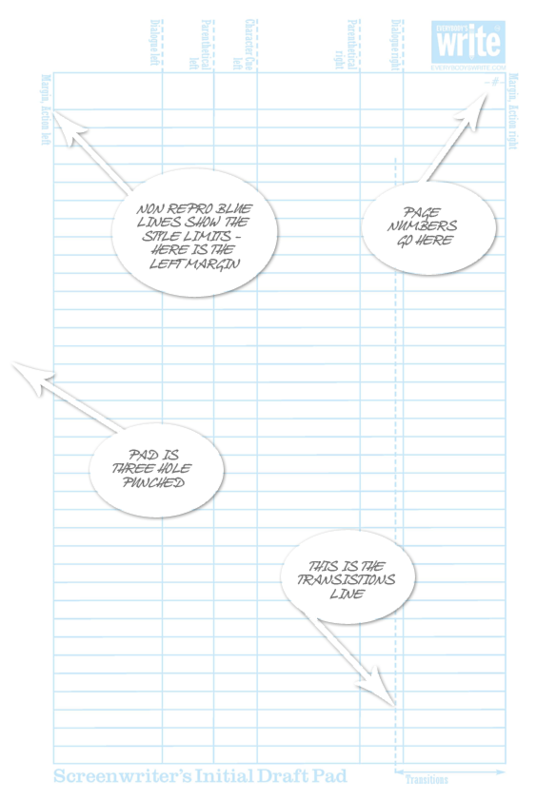 The Screenwriter’s Initial Draft Pad is the Lexus of legal pads for screenwriters. — Dustin Paddock, screenwriter and script coordinator, House, M.D. 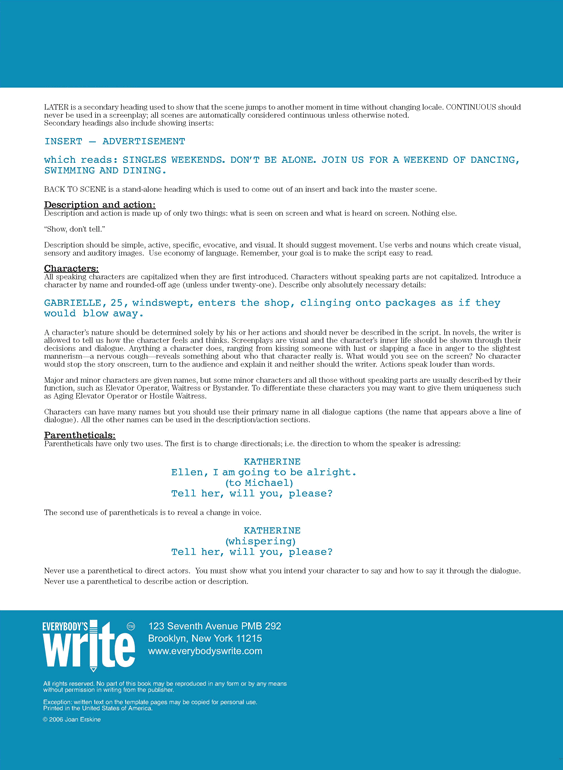 Contestants used the Screenwriter’s Initial Draft Pad during each of the 2006 and 2007 Creative Screenwriting Open Competitions. 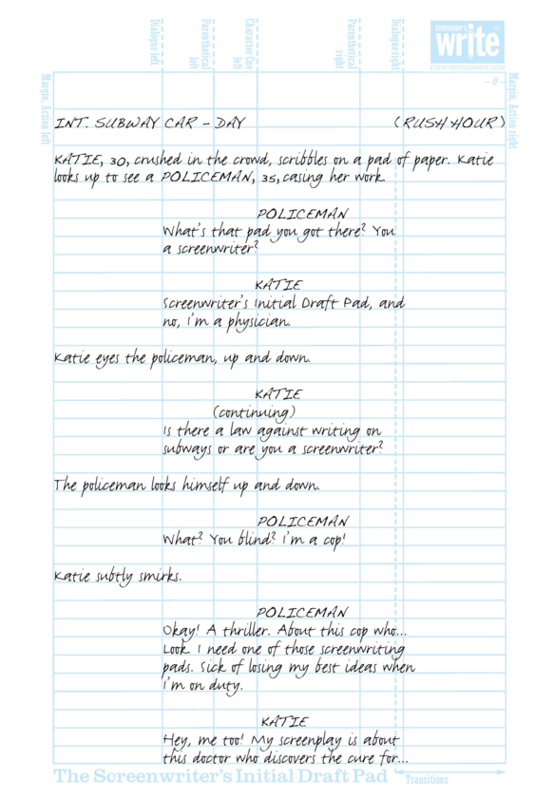 The Screenwriter's Initial Draft Pad was a godsend, a perfect solution for our needs — 2400 writers who had to handwrite scenes on the spot, in proper screenplay format. 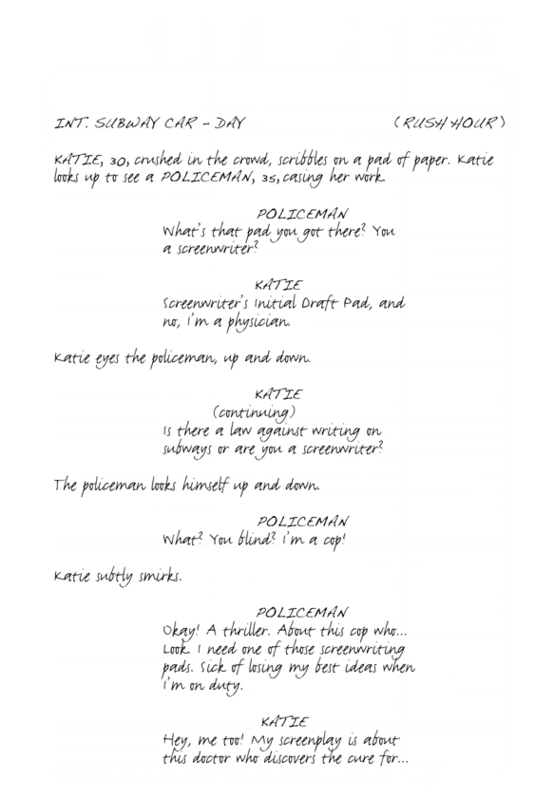 This elegant solution reminded writers how their scripts needed to look every step of the way, and the blue lines vanish when photocopied for use in the staged readings. Great stuff! Used by directors and writers alike for quick changes during production! Copyright © 2012-2019 Everybody's Write LLC.